Girl is Mascot of Novel Booster Organization, Which Was Awarded Flags by Ben Selling. The interest that is being manifested in the question of woman’s suffrage among the younger element is evidenced by the fact that within the last week two clubs devoted to the cause of woman’s suffrage have been organized among Portland boys. The more remarkable of these clubs is the Oregon Junior booster Club, composed entirely of Jewish boys from South Portland. The club was organized by Izzy Kerchefsky, who has been elected its president, and is under the patronage of Dr. Marie Equl , of the National College Equal Suffrage Association. The membership is limited to 12 members, including one girl, who is the mascot. Most of the members are of a musical bent, and a musical organization is planned among their numbers. Both of the boys’ clubs will participate in street meetings and other demonstrations that are to be held in the course of the campaign. 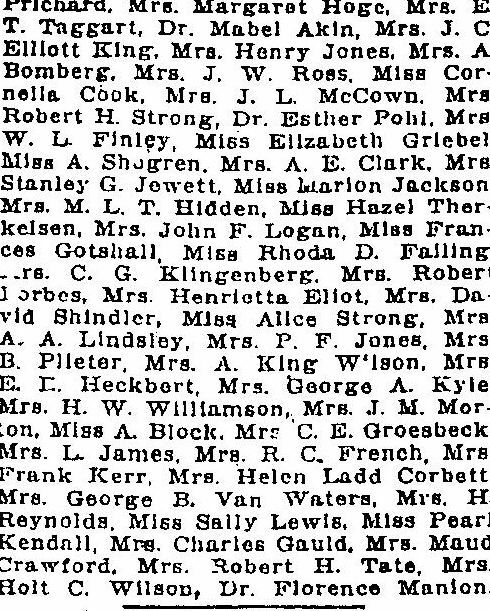 Mrs. A. E. Clark is the organizer of the second club. The Booster club was yesterday awarded 17 large American flags by Ben Selling. Shortly after their organization last week they were also the guests of Mr. Selling at a luncheon. The following were its members; Izzy Kerchefsky, president and organizer; William Charack, vice-president; Silvia Kreisberg, mascot; Eugene Kreisberg, Leo Seltzer, Jake Gurien, Harry Shulman, Mose Shulman, Jake Minsky, Ben Kerchinsky, Sam Nudleman, Tommy Charack. To assist in the campaign in opposition to woman’s suffrage in this state which has been undertaken by the Oregon society opposed to suffrage for women, Miss Martin, of New York, an anti-suffrage speaker of wide reputation, will arrive in Portland Sunday and will deliver a series of addresses in this city and at various points throughout the state. Miss Martin is at present in Wisconsin, where an equal suffrage campaign is now under way. She recently made a tour of Kansas in opposition to the campaign which is also being carried on there for equal suffrage. Just how long Miss Martin will be in Oregon has not yet been determined.